The Slap-Dash Dinner instead of Eating Crap! (serves 4) | Crappy Kitchen - Good Dinners! I just had to post this recipe, if for nothing else but to prove the point that you can make dinner without expending an ounce of energy or without dashing off to the supermarket for that missing ingredient! Have you ever been too tired to cook, but when you ordered out or drove 10 minutes each way for take-out, OR, stuck a frozen pizza in the oven and ending up being so dissatisfied with what you ate that you wished you had cooked something, or even settled for beans on toast: Of course you have! The other night when it was time to make dinner my brain had stopped working and I started going through all of the ways I could get out of cooking dinner. Then I snapped out of it, that trap you get yourself into over what to eat and where to get it. If you live in a town as dismally lacking in food choices as I do, then you will have had the experience of settling for something, crossing your fingers it will be good, and then feel like you ate slop for dinner! That is when I figured out if I was going to eat slop, I might as well make it myself; it was bound to be better and I wouldn’t be charged for the pleasure. It may look “thrown together” but don’t let that fool you – it tasted delish! At that moment I put my trusty pan on the counter and started filling it with whatever came in contact with my hands. This is what we ended up with, a veritable smorgasbord of a feast, one I lapped up with immense satisfaction knowing I hadn’t wasted my money on what was sure to have been another disappointing dining experience. 1 cup chopped cilantro (if you don’t have this and you have flat-leafed parsley, use this instead! 1 – Place all of the prepared veggies in the bottom of a roasting pan or saute pan or low rimmed casserole dish. If you are using a bouillon cube, crumble it over the veggies. Wrap 1 stripe of bacon around each chicken bread and place on top. 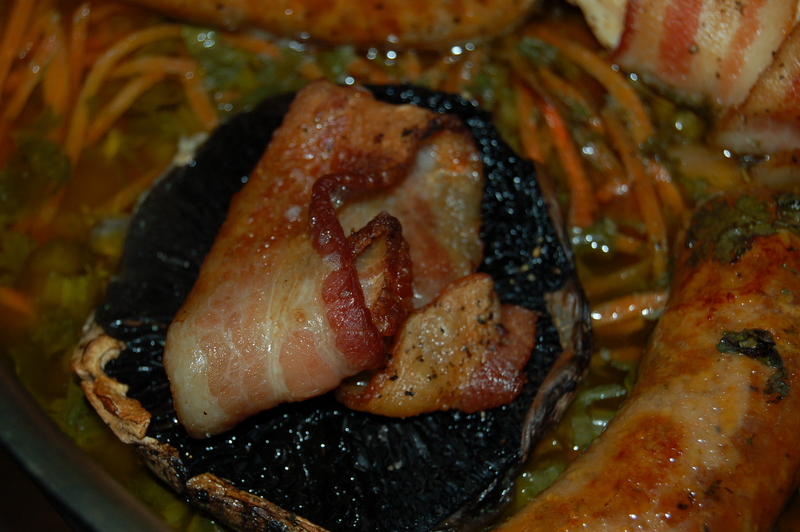 Place Portobello mushrooms and sausages in pan and put a stripe of rolled bacon on each mushroom. Grind some pepper over entire dish and drizzle with the oil. Place in oven for 25 minutes. 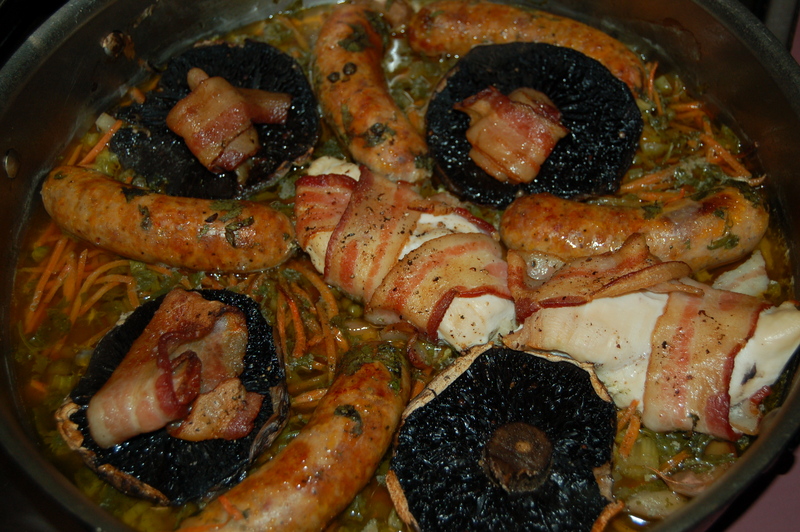 2 – Remove dish from oven and turn the sausages, the bacon on top of mushrooms and the chicken breasts. Return to the oven for another 20 minutes. Slap-Dash dinner is ready to eat! Serve with whatever you like: pasta, bread, rice or on its own. 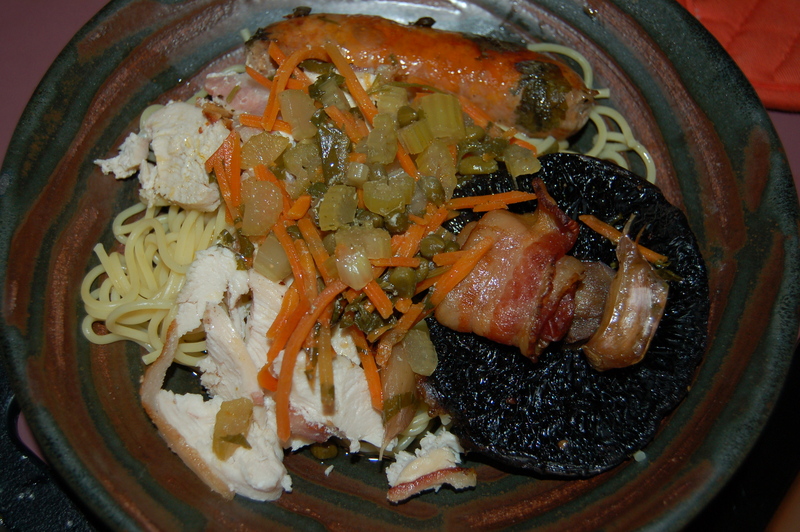 This entry was posted in dinners and tagged bacon, bacon wrapped chicken, cilantro, easy dinner, italian sausage, one pan dish, one pot meal, portobello mushroom, quick dinner, roasted chicken and sausages, veritable smorgasbord. Bookmark the permalink.